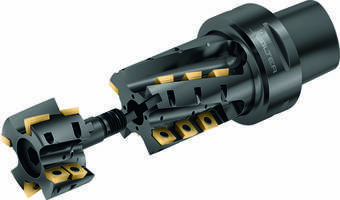 The M4258 modular helical milling cutter from Walter is available in Tiger∙tec® Gold and Six Tiger∙tec® Silver​​​ grades. It can be used for slot milling, ramping, pocket milling, shoulder milling, and circular interpolation. The cutter can handle ISO material groups P, M, K, and S. The M4258 has a diameter range of 2.0, 2.5, and 3.0 in. It features interfaces that are Walter Capto C6 and C8. The modular, cost effective M4258 brings both high performance and excellent process reliability to slot milling and other applications. Tiger∙tec® Gold and Six Tiger∙tec® Silver​​​ grades are available, covering nearly all ISO groups. The modular design of the M4258 features an exchangeable front-end piece that can be replaced when this section of the body is worn or damaged. Precise and safe positioning of the front-end is assured due to its tongue and groove connection with the register pin. Features like this, combined with four/two cutting edges per insert, boost cost efficiency and reduce procurement and inventory costs and requirements. Process reliability is enhanced by several features. Starting with a half-effective design and highly positive insert geometry, lower power requirements and costs that offer a strong advantage. An internal coolant supply in the standard offering adds versatility, along with superior chip removal. Operating under low cutting pressure, its compact length and effective design promotes smooth operation. This reduces oscillation and vibration, making it a solution for a variety of unstable machining conditions. The M4258 has an approach angle of 90° and a diameter range of 2.0, 2.5, and 3.0 in. (50, 63, and 80 mm). Interfaces are Walter Capto C6 and C8.